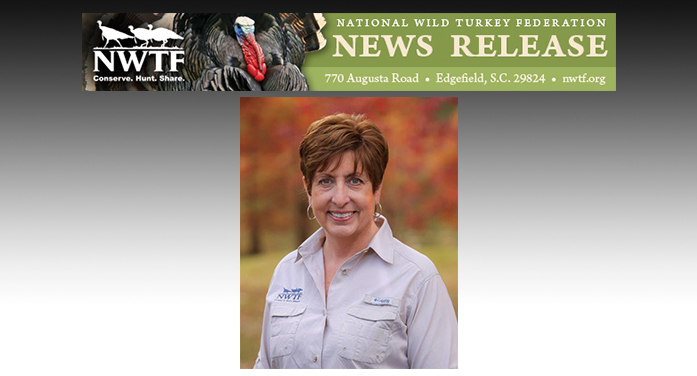 EDGEFIELD, S.C. – The National Wild Turkey Federation Board of Directors announced Becky Humphries as its new chief executive officer, a role she will assume effective April 10, 2017. “I am honored to be appointed CEO of the National Wild Turkey Federation,” said Humphries. “I came to this organization because I wanted to help save the habitat and the hunt, and we are well on our way to achieving all of our goals through the strength and great work of our dedicated staff and volunteers”. Humphries previously served the NWTF as vice president of conservation and also chief conservation and operations officer. Under her leadership, conservation staff identified habitats across the nation with the most immediate conservation needs, now known as “America’s Big Six of Wildlife Conservation.” The department then developed partnerships for the betterment of the most critical wildlife habitats and worked with state chapters to launch management plans that advance the Save the Habitat. Save the Hunt. initiative. “With Becky as the new CEO, the NWTF is poised to continue its conservation success well into the future,” said Marvin Hartley, NWTF board president. Outside of her work with the NWTF, Humphries currently serves on the Steering Committee for the Blue Ribbon Panel on Sustaining America’s Fish and Wildlife Resources of the Association of Fish & Wildlife Agencies and chairs the Wildlife Health sub-committee for the Boone and Crockett Club. Humphries also serves on the Council to Advance Hunting and Shooting Sports and the Wildlife Hunting Heritage Conservation Council. Humphries’ impressive rsum details more than 40 years of experience in wildlife management and conservation. Before coming to the NWTF, she served as the director of operations in the Great Lakes/Atlantic Region for Ducks Unlimited, focusing on conservation delivery, policy and science. She also served the Michigan Department of Natural Resources and Environment for 32 years, including seven years as department director. Previous NWTF CEOs include George Thornton, Rob Keck and founder Tom Rogers. When the National Wild Turkey Federation was founded in 1973, there were about 1.5 million wild turkeys in North America. After decades of work, that number hit an historic high of almost 7 million turkeys. To succeed, the NWTF stood behind science-based conservation and hunters’ rights. Thanks to the efforts of dedicated volunteers, professional staff and committed partners, the NWTF has facilitated the investment of $488 million in wildlife conservation and the preservation of North America’s hunting heritage. The NWTF has improved more than 17 million acres of wildlife habitat and introduce 100,000 people to the outdoors each year. The NWTF Save the Habitat. Save the Hunt. initiative is a charge that mobilizes science, fundraising and devoted volunteers to raise $1.2 billion to conserve and enhance more than 4 million acres of essential wildlife habitat, recruit at least 1.5 million hunters and open access to 500,000 acres for hunting. For more information, visit NWTF.org.